Each season, The CW likes to release a handful of posters promoting its most popular shows. Quite frankly, I think The Flash gets a little favoritism in that arena, but you can’t argue with the stunning results. Not long ago, we were treated to an eye-catching piece that included Gypsy, which I assumed to be the final promotional one-sheet we’d receive for this season. As it turns out, I was wrong, because a new one recently dropped, this time splitting the focus between the Scarlet Speedster and Amunet Black. To be honest, I can’t fault anyone for shining the spotlight on Katee Sackhoff’s character ahead of “Harry and the Harrisons,” given her rapport with the geek community. Already, we’ve seen a good amount of images circulating that are centered on her, which I felt to be a wise choice because the Council of Wells’ return seems like the less enticing subplot. 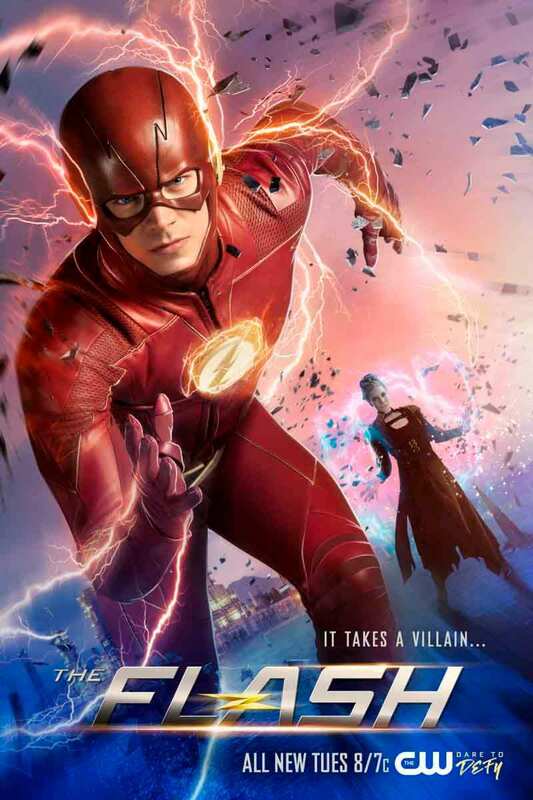 At face value, it’s hard not to draw comparisons between the poster and the artwork of Francis Manapul, for this looks like the cover to The Flash Vol. 1: Move Forward come to life. If you don’t believe me, look it up and judge for yourself. Suffice it to say, the graphic design team deserve another pat on the back. THE TEAM TURNS TO AMUNET BLACK FOR HELP — With DeVoe’s Enlightenment device nearly complete, in order to disable it The Flash (Grant Gustin) and his team must put their faith in an unlikely ally — Amunet Black (guest star Kattee Sackhoff [sic]). Meanwhile, Harry (Tom Cavanagh) hits an all-time low when the “Council of Wells” kicks him out but then Cisco (Carlos Valdes) introduces him to the “Council of Harrisons.” Kevin Mock directed the episode written by Judalina Neira & Lauren Certo (#421). Original airdate 5/8/2018.